An Upstate entrepreneur’s gym franchise has garnered two national awards. 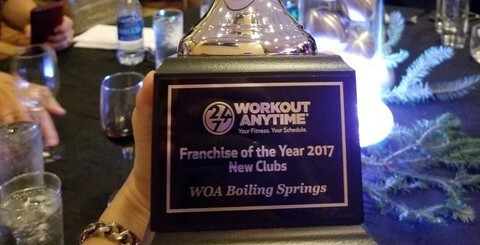 Aaron Davis, owner of Workout Anytime at 1915 Old Furnace Road in Boiling Springs, received a Franchise of the Year award among new clubs and a People’s Choice award for Best Social Media for 2017. 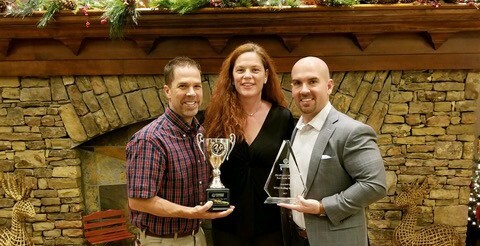 The awards were presented at the Atlanta-based 24/7 fitness chain’s annual convention held Nov. 30 through Dec. 2 in Stone Mountain, Ga.
Davis, who is originally of Greenville, owns and operates 17 Little Caesars Pizza restaurants throughout Greenville and Pickens Counties. He opened his first Workout Anytime in January 2017 in an 8,500-square-foot space near Boiling Springs High School. “Aaron and his team are doing a tremendous job,” said Mark de Gorter, chief operating officer for Workout Anytime, which boasts 143 clubs in 19 states across the U.S. and plans to reach 150 locations by the end of the year. Please join us in congratulating Aaron Davis of Workout Anytime Boiling Springs, who received two awards at our annual conference: Franchise of the Year award among new clubs and a People’s Choice award for Best Social Media for 2017. Davis received a Franchise of the Year award among new clubs and a People’s Choice award for Best Social Media at Atlanta-based Workout Anytime’s annual convention held Nov. 30 through Dec. 2 in Stone Mountain, GA.
Davis is in the process of opening his second gym in the Upstate in an 8,000-square-foot space at 700 E. Main St. in Duncan near Byrnes High School. He anticipates opening that location in late January. Davis said he believes Workout Anytime’s value pricing and offering of month-to-month memberships are a few ingredients that have helped his franchise grow during the past year. State-of-the-art equipment, tanning, HydroMassage, 24-hour access, and friendly and knowledgeable staff are just a few other amenities Davis said his customers have enjoyed. “We will be trying to duplicate everything [at the new Duncan store] that we’re doing in Boiling Springs,” he said. Davis said that includes supporting Lift for the 22, a nonprofit headquartered in Oregon that seeks to fight the veteran suicide epidemic by creating a support network centered on fitness. Through its partnership with Lift for the 22, Workout Anytime locations annually offer 22 local veterans one-year gym memberships for free. Davis said he plans to launch the offer at his Duncan facility in mid-2018. The owner said pre-sales for memberships at the Duncan location have begun, and prospective members can sign up at a trailer in front of the new space.